TAMPA, Fla. -- People living in South Tampa showed they continue to support the family of the mother and toddler killed in a street racing crash. 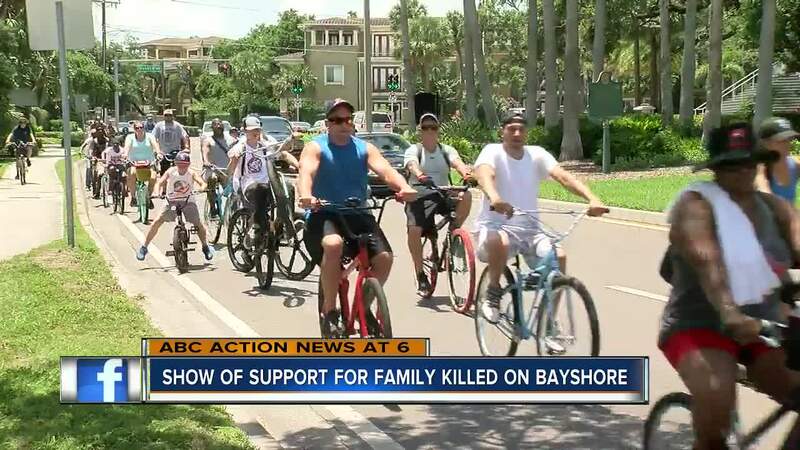 They rode the entire span of the balustrade stretch of Bayshore Boulevard on Sunday to honor Jessica Raubenolt and her 2-year-old daughter Lillia and raise money for their family in Ohio. "They really do care," said Jayden Molette, an 11-year-old who decided to jump on her bike and ride with her family and the rest of the group. "I mean we wouldn’t be out here if we didn’t care at all." Raubenolt was visiting relatives in Tampa when an 18-year-old driver going 102 mph hit her and the stroller carrying the girl as they crossed Bayshore. "Being a father myself it just really hit close to home," said Jeff Abreu, the organizer of the event. He's also apart of 813 Pedal Pushers. All of these neighbors related to the tragedy in their own way. "My heart was totally devastated," said Tina Rodriguez, who helped with the event. Each of them want Jessica and Lillia's family to know how sorry they are for what happened. "Just to do something, Man. Really let the family know we are thinking about them," said Abreu. "If we can lift them up in any kind away that’s really what matters." "It was definitely a tragic situation that happened, and I definitely wish it could’ve been prevented in anyway shape or form," said Molette. Police even joined the efforts and escorted them safely down the road. They were also raffling off three bikes with the proceeds going to the Jessica and Lillia's family. They are also asking for the City of Tampa to step up when it comes to making area roads safer. "You need signs. You need markers on the road, flashing lights. Plus as the City of Tampa is growing there’s a lot of people coming to the city and they really need to do something about it," said Abreu.